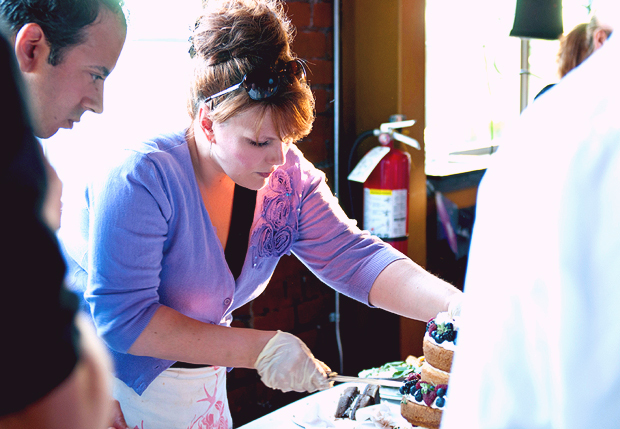 Our gorgeous wedding cakes were made by our friend and baketress, pastry chef Beth Sielicki. They were totally vegan, totally delicious, and looked almost too pretty to eat (almost). They were ravaged by young hipsters, moms and dads, elderly folks and small children alike. Beth is trained in the arts of normal, non-vegan cake making too, and I heartell the woman can even handle gluten free. So basically, what I'm getting at is this: do you live in Michigan? Do you need pastry? EMAIL ME. I will hook you the eff up. 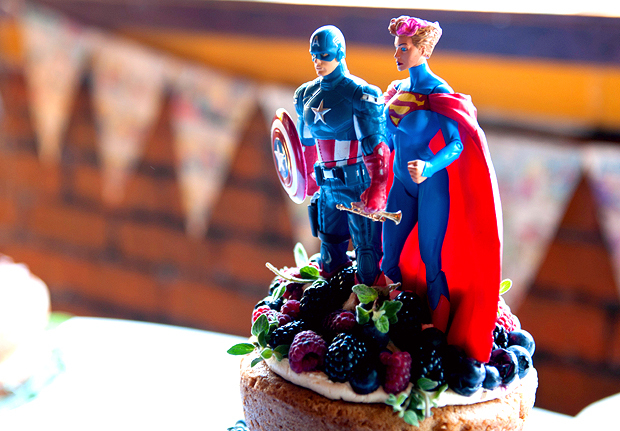 MC and I didn't choose our DiY superhero action figure cake toppers out of any single obsession with Captain America and Supergirl. 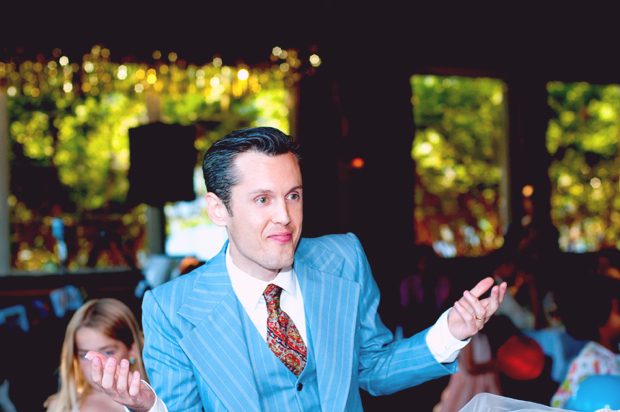 I just kind of always thought that MC was sort of Captain A-esque, with his matinee idol good looks and old fashioned good manners. And while MC seems to see me as something of a superheroine in general (just check out Reminds Me of My Girl), this particular edition (from the Elseworld series, which I randomly spotted on the internet and tracked down on Ebay for $14) had a very familiar hairstyle. We hot glued a trumpet charm I'd given MC a couple years ago into Captain America's hand and added Supergirl's pink streak with a little acrylic paint. I couldn't find stands the right size, so Beth just mooshed their feet into a pile of frosting. The scrumptious vegan cakes Beth made for us included: red velvet cake with raspberry coulis and vegan cream cheese frosting, chocolate cake with vegan whipped cream and white frosting, orange lemon cake with apricot jam and chocolate frosting, simple vanilla cake with chocolate frosting, and our tiered cake was a perfect vanilla cake with berries and white frosting. I semi destroyed half the cake during our ceremonial cake cutting. There is a reason professionals do this. 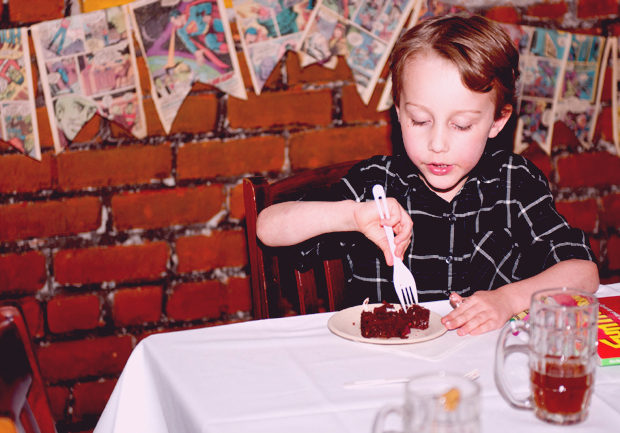 The best thing about this progression of photos is Gbear suddenly appearing from behind us when she saw that cake was happening, Girl wanted IN on that. 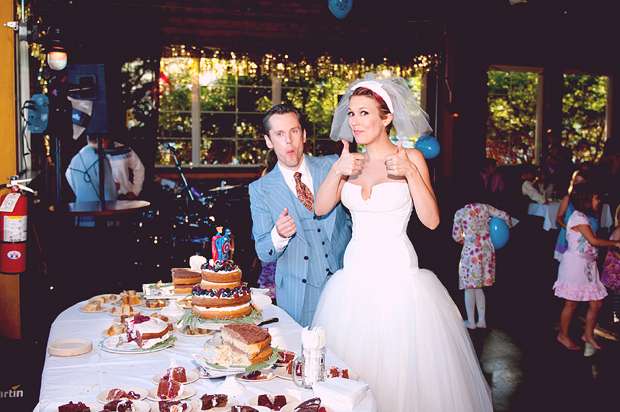 You can almost hear her saying "Is it time for cake? I was told there would be cake." Beth, the beautiful caketress herself, did a far more elegant and efficient job of slicing the beauties up. 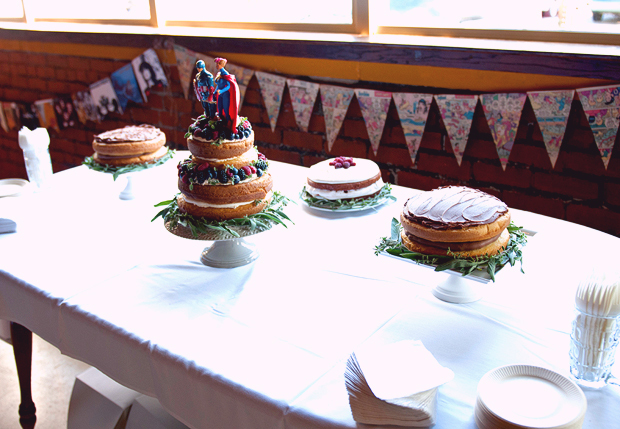 She even provided her own beautiful cake stands to serve them on! And after slaving in front of ovens and mixers, doing manual labor with a knife amidst semi-inebriated guests and hyperactive children, and watching throngs of happy revelers devour her perfect creations, the lady was still all beautiful smiles! This is where it gets really cheezy: my mom always told me when I was learning to bake as a kid, that love is a real ingredient. And think of it: people eat the food you make, and their bodies will repurpose the very molecules in it to create new cells. You help recreate a person when you cook for them, so you'd better imbue that food with loving, positive energy, right? Well clearly, Beth gets this innately. 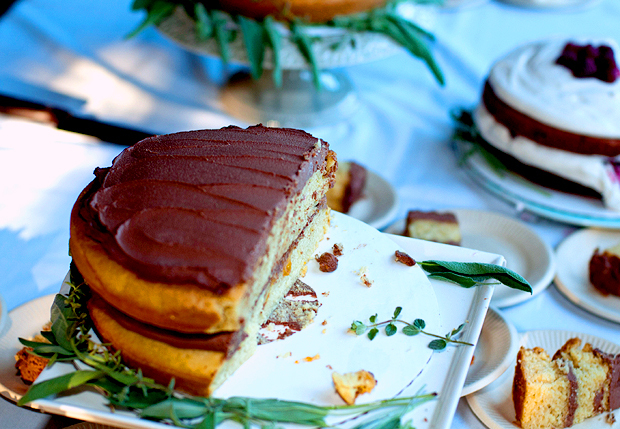 Because she's a personal source of delightful energy, and her cake is freaking tremendous. Thank you, Beth! 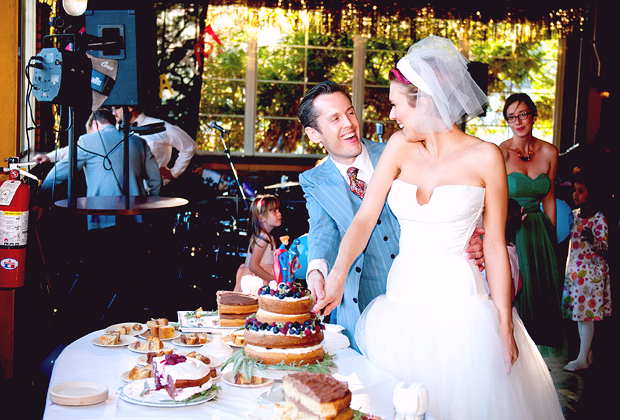 the cake looks so tasty! 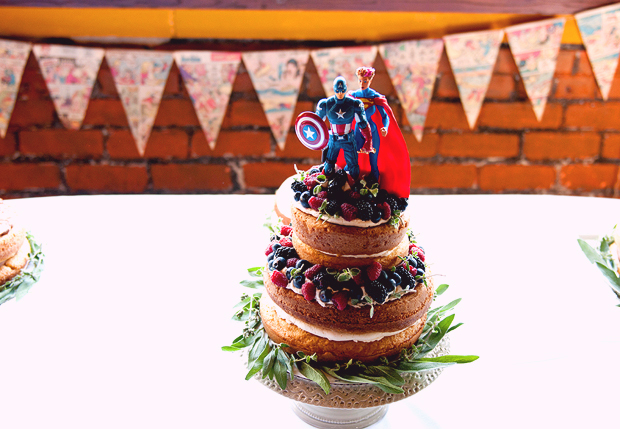 love the superheros on the top of the cake! 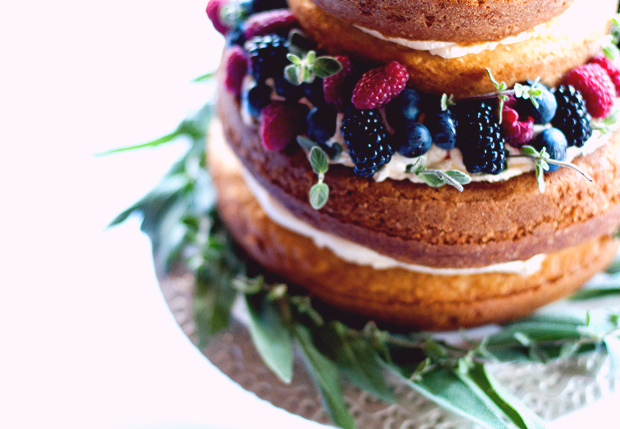 Gorgeous cakes, and I love the herb garnishes - especially the downy fuzz of sage that tempts you to rub a leaf between your fingers (sage is my favorite herb, can you tell?). The other herb looks to be marjoram, thyme or maybe Greek oregano...? 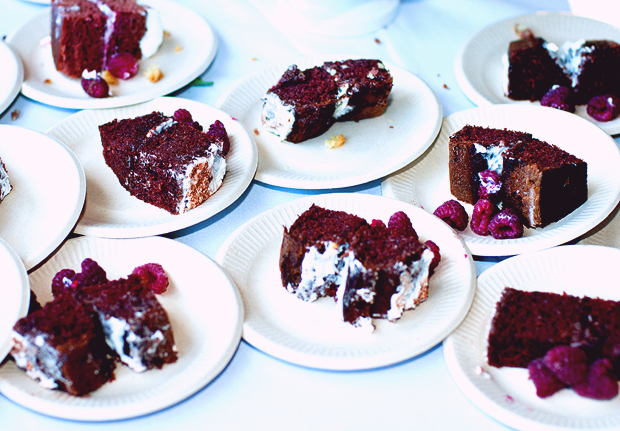 Also, vegan red velvet cake is one of my favorite treats in the whole wide world. It was in the Plus column when we decided to move to the South. And yeah, your mom totally has it right - love IS an ingredient. You have it right, too - I actually use the words "imbued with love" whenever I explain to Nina why something we make from scratch, in our kitchen with our bare hands from the flour-spattered pages of a family cookbook is the best food in the whole wide world. 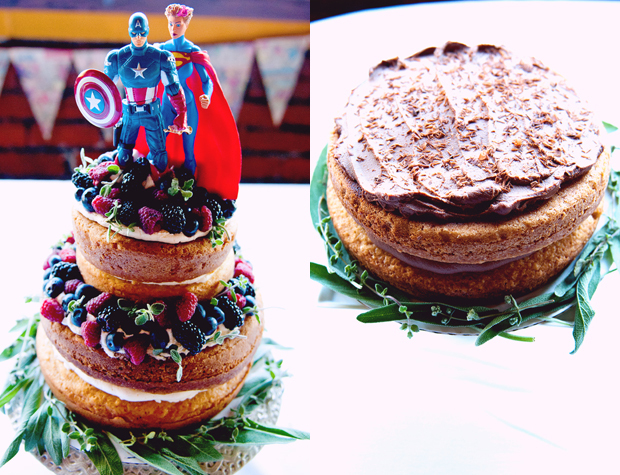 These cakes looked amazing! :D I must try to do one on my own. I wonder how it will turn out? GORGEOUS (and vegan! YES!) 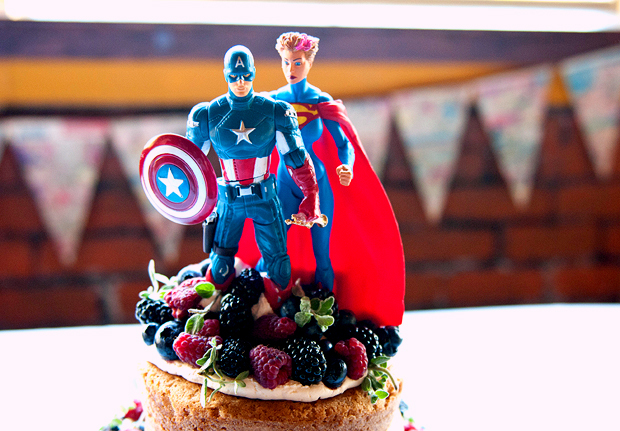 cake, and you really can see your joint resemblance as a couple to your respective action figures on the cake. The trumpet is the best touch. Such lovely pictures!! That looks like some legit cake! I know a bunch of people who have not yet experienced the wonder of a nicely-done vegan pastry, and I weep for their souls. 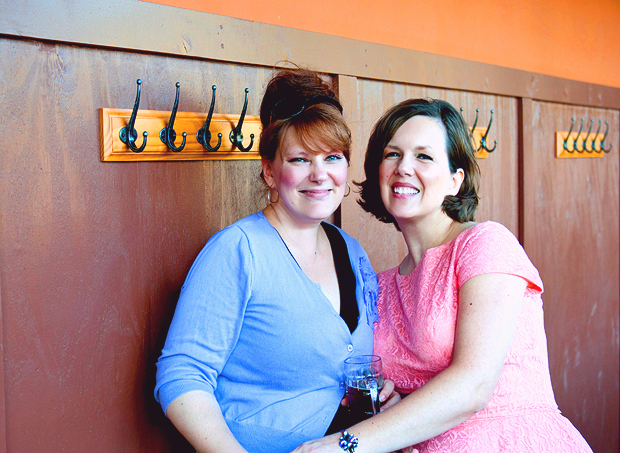 Nice photo of Beth and I. Yay!